Wanderlust takes you not only to spectacular sights and places but it certainly introduces you to new food. Oftentimes, food creates a deeper insight of the culture (diverse or pure) that resides in the town you visit. Couple the experience with a bit of history and you gain a different level of respect for the creators and hands that birthed the name and fame they have today. I'm not a huge fan of sandwiches but the original Philly Cheese Steak at Pat's King of Steak certainly made an impression. The name is derived from its creator, Pat Oliveri, who discovered the recipe back in 1930. He began by selling hotdogs on a stand near the Italian market in South Philadelphia until one day he decided he'd do something new. Instead of hotdog, he filled the bread with sliced grill steaks which were first patronized by taxi drivers. Not too long after, news spread making it a big hit that got restaurants to start selling their version of the same thing. Today, the place is frequented by tourists and has become a go-to stop in most Philadelphia tour itineraries. 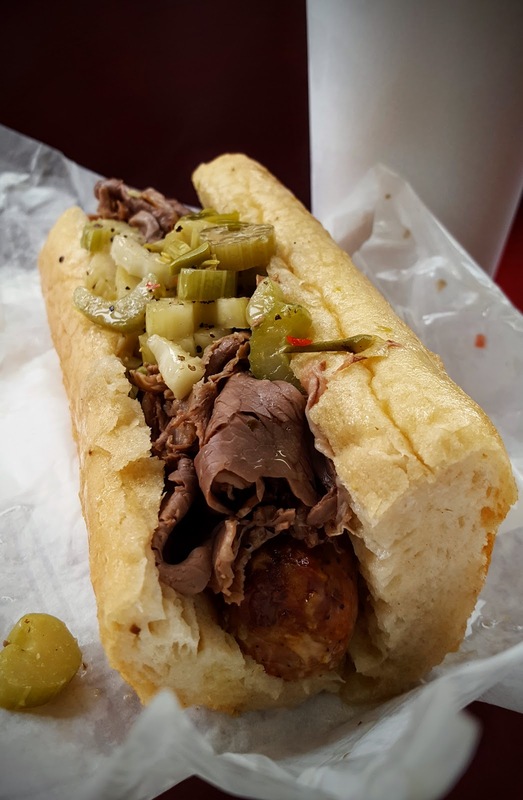 Their huge hoagie roll is generously filled with thinly sliced grilled beef steaks and topped with melted cheese. At the side of the store, a stainless steel cart stands full of grilled cherry bell peppers and dried dark chili for anyone who'd like them for sandwich toppings. Calorie is certainly one thing but making a pass on a deliciously juicy treat would be awful. Chicago has a similar version in Mr. Beef. Their Italian Combo Sandwich has both sausage and cooked rib-eye meat. The beef flavor is unmistakable. While you chew the chopped steak the smokey cow fat aroma enters your nostrils. This sandwich tasted fresh and excellently seasoned. The bits of cooked celery as toppings made quite a distinction but the overall taste is certainly reminiscent of Pat's King of Steak without the cheese. You may want to eat it fast though cause I think the steak juice can wet the bread quite a bit making it hard to keep the filling intact. Thanks to The Jimmy Fallon Show for making a buzz of it in one of its episodes last year, a follow-up to the first one he did back in 2013 where he called it a "killer deal". This sandwich has smitten both him, Gabrielle Union and Jay Leno. Four blocks away from the my office stands The National which is home of the Revival Food Hall that shelters 15 restaurants constantly flocked with people of every type and ethnicity -- mostly employees from offices around downtown Chicago. I remember the first time it opened. The line was long and extending outside the building. People did not mind the cold. All wore excitement on their faces even as they stood in front of a staff who stood (arms folded) looking like an intimidating bouncer in a nightclub making sure the crowd inside has room enough to move around. I did not join the crowd that day but returned 3 months after when the hype has gone down. One restaurant queuing heavily was SMOQUE BBQ. Five guys formed it out of pure passion on food, particularly barbecue. Their specialty is the barbecue-seasoned beef -- smoked until tender. 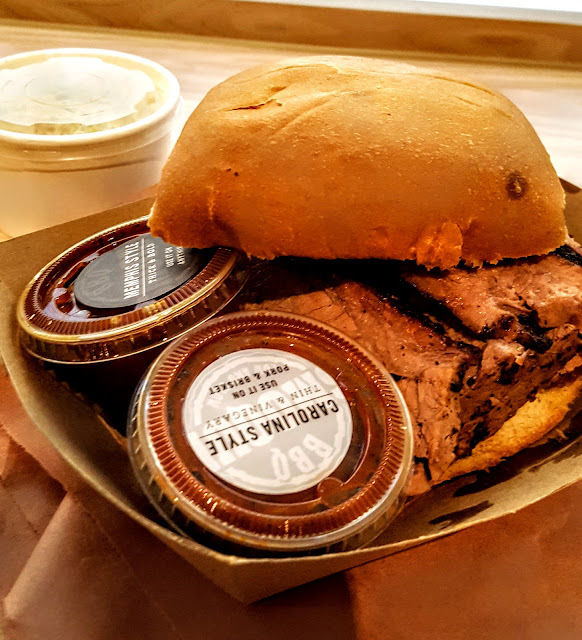 They pride the use of hardwood smoke and pungent (sour) sauce which makes the balance on taste leaving customers feeling as if they are in "BBQ heaven". Meats (steaks) are most American's staple food. Curious of the American palate, I brought along an American colleague on a second visit to sample their sliced brisket sandwich. I asked if that was the taste he'd describe "distinctly American" but it turned out he shares my similar impression. The food was great - meat was tender, juicy, and the barbecue flavor is confirmed in taste and smell. The black surface of the meat initially scared me a bit as it looked charred but the pinkish color behind the thin dark layer overcame my worry. It was surprising that the fat blackened by long exposure to hardwood smoke did not taste bitter at all. The only thing we hoped it had more of was flavor inside as it seemed concentrated only outside. Also, cheese and vegetables would be nice in BBQ heaven too. This stall in the hall sold spicy fried chicken. I like the fact that it was perfectly cooked inside and not dry outside. The spicy rub gave its crispy fried skin the color and flavor you see when served. I find it very difficult to make comments on fried chicken as I am biased for Korea's soy garlic fried ones but this is certainly not bad. 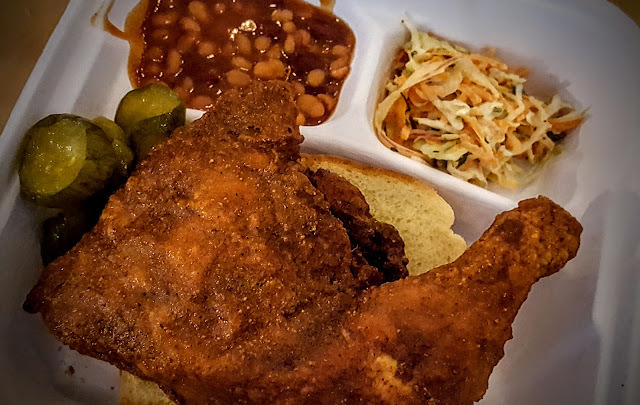 The chicken is served with pickles, beans, a Texas toast, and coleslaw. Probably the only Asian shop of the 15 stalls inside. The adjective on its name is quite catchy and it encourages an appetite. It being the only asian store kinda has its advantage. It pulled me in among Thai, Chinese, and Japanese customers in a line. Americans who've learned to love the taste of Asia wait in the queue as well. Ramen was its specialty, so I bought myself a bowl and delightfully worked my spoon and sticks in it. 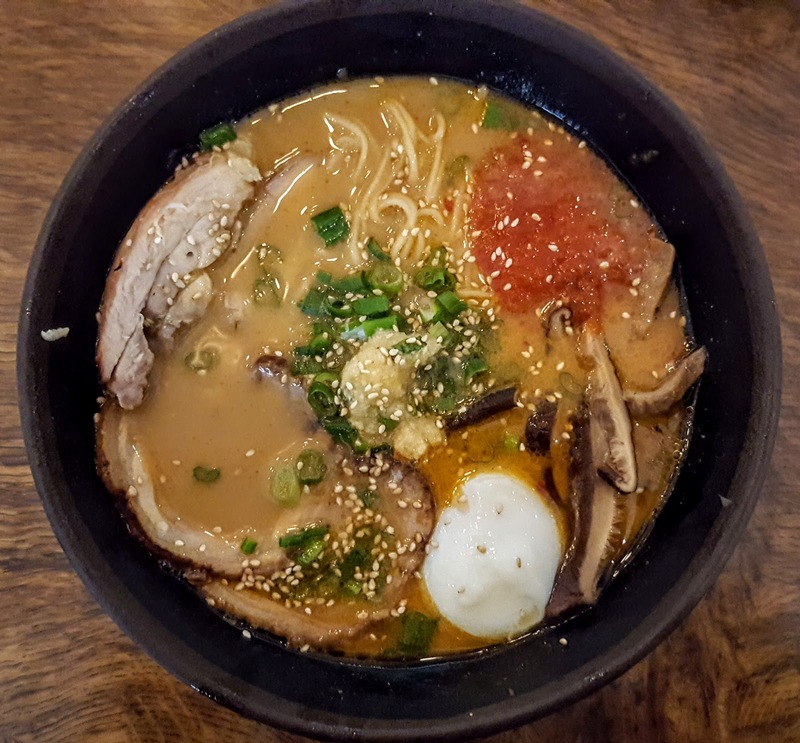 The mushrooms were fresh and for some reasons I preferred it more than the sliced pork belly. The soup turned creamy after the egg was cut and mixed, but, slightly bitter.